Looking for ways to make your car look new again? For the last decade, we've offered full valeting and tyre sales to give your car a new lease of life. If you want your car to sparkle and look as good as the day it rolled off the production line, give us a ring! Our valeting service includes deep interior cleaning, leather upholstery cleaning and exterior work. Tyres may wear out, but there’s no reason why it should be a massive hindrance! We provide a range of new and part-used tyres for all vehicles – and we sell at competitive prices! Not sure whether a car valet is exactly what you need? Not sure if the results are worth it?Contact us and have a chat with one of our staffregarding your requirements. We’re always happy to help you out, so call today. We are a family run business based in Shepton Mallet with over 16 years experience in the motor trade. We offer a vehicle Valeting Service and New and Part-Worn tyre sales. We provide a range of new tyres and excellent quality branded part-worn tyres at affordable prices for all vehicles. Our valeting service includes everything from Full Valets to a Outside Wash, we can tailor your valet to suit your needs. We provide unique levels of customer service, value for money and unbeatable car valeting throughout Shepton Mallet and Somerset. 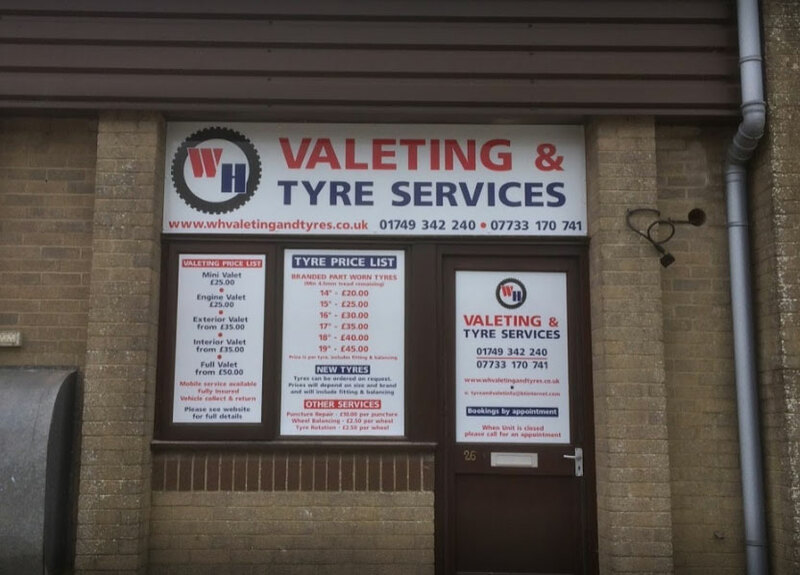 Our tyre fitting service is cheaper than most of the major tyre firms as we don’t have the overheads that the bigger companies do so we can pass the savings down to our customers. We are a trading standards approved part-worn tyre supplier so you can always buy from us with confidence. If you have a puncture, need your tyres checked for your MOT or need some new tyres simply come and see us, you won’t be disappointed.